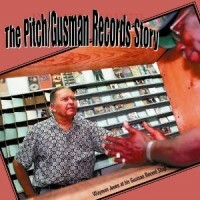 There have been many interesting reissues of black gospel music in recent years, but the Pitch/Gusman Story is notable for shedding light on a little known company out of Savannah, Georgia, operated by Waymon “Gusman” Jones. According to the liner notes, noted scholar David Evans “discovered” the recordings back in the day when he visited Gusman’s record store, and was largely responsible for spreading the news amongst fellow collectors and crate diggers. When word trickled down to John Glassburner, a gospel collector who also dabbles in artist and label compilations, he decided to make it his mission to track down every record and historical detail about Waymon Jones. To make a long story short, Jones decided on a mid-life career change and returned to his hometown of Savannah in 1967 to open the Gusman Record Shop (“Gusman” was apparently his nickname). Though secular records were the mainstay of his business, Jones’ personal preference was gospel music (two of his brothers sang in a quartet, and their father was a deacon). Before long, his shop became a hang-out for local gospel singers, and Jones quickly expanded his role to label owner, recording engineer, and producer. By the late ‘60s, Jones was issuing 45s on the Pitch label, which he apparently purchased, and later added his own Gusman label. His recording activity continued until 1978 when, due to economic constraints, he decided to concentrate solely on his store. Waylon Jones passed away in 2004 at the age of 72, and if not for Glassburner, his story may never have been told. Thanks to the community of gospel record collectors, 71 rare recordings from the Pitch and Gusman labels have been made available for this project. Produced by Glassburner and Bruce Watson, with notes by gospel historian Alan Young, the three CD compilation is primarily laid out in chronological order. Disc One is devoted to Pitch 45s recorded between 1961-1975 and features 12 different groups from South Carolina and Georgia, including quartets and solo artists, such as Evangelist Loretta Myles. Disc Two reproduces Pitch and Gusman LPs pressed between 1977-78, the final years of the labels. Artists include the Golden Stars of Greenwood, SC , the Sensational White Family Singers of Savannah, the Mighty Reverlaires, and the Six Voices of Zion from Columbia, SC. The third disc includes the remaining Pitch 45s from the late ‘60s along with four Gusman 45s from 1973, again featuring a mix of quartets and soloists. Overall, the selections reflect Jones’s preference for the traditional, and are largely devoid of the contemporary leanings of the ‘70s. This entry was posted in Gospel Music and Spirituals by aaamc. Bookmark the permalink.